About 5 years ago, I got to spend a day visiting the Park School Math Department. At the time, they were just beginning a project to develop a math curriculum from scratch, based around 14 Habits of Mathematical Thinking. 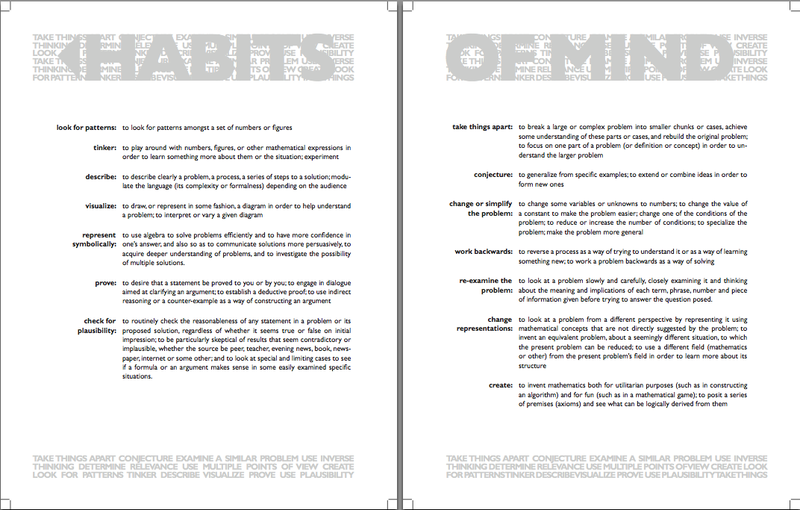 (I’ve written about these habits before, and even tried to create my own set of habits of scientific thinking). The parts of the curriculum I saw at the time were outstanding—organizing a curriculum around 14 habits of mind—Tinker, Visualize, Prove—seemed like a genius move, seeing them atop every blackboard in the department, and hearing students actively refer to these habits throughout the day convinced me that the were on to something big. In the intervening five years, the teachers of the Park Math department have developed a complete 4-year high school math curriculum, and they are willing to share it with anyone who asks for it. You can read more about the curriculum and see sample lessons from the curriculum on the Park Math Blog (another awesome math blog you should be reading), and if you want to see the whole thing (you do), you can email parkmathblog@parkschool.net. Not only is this curriculum filled with outstanding math thinking and problems, it looks like a similar amount of care was taken with its appearance (it was designed by a teacher in the department, Anand Thakker). The text is beautiful. 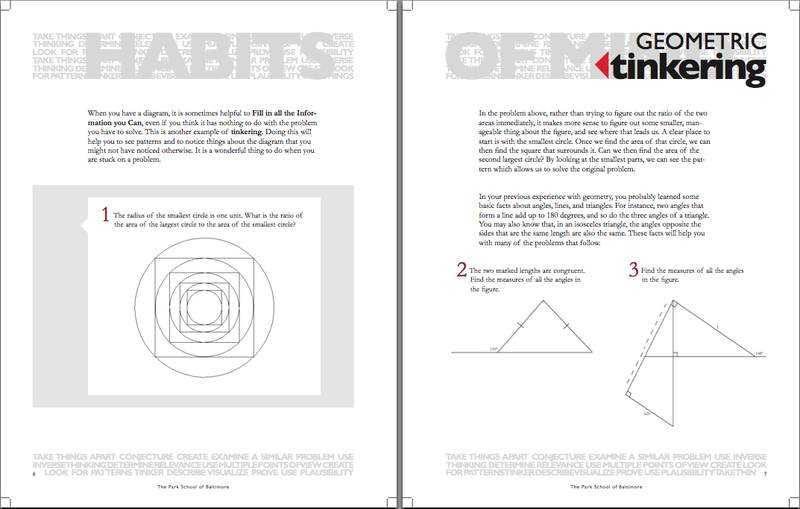 Here are just a few images to whet your appetite and get you to send the email for your own copy. This curriculum was written by members (past and present) of the upper school math department at the Park School of Baltimore. This was possible thanks to Park School’s F. Parvin Sharpless Faculty and Curricular Advancement (FACA) program, which supports faculty every summer in major curricular projects. In addition to the support of FACA by the Nathan L. Cohen Faculty Enhancement fund and the Joseph Meyerhoff FACA fund, this project was also funded by grants from the E. E. Ford Foundation, the Benedict Foundation, Josh and Genine Fidler, and an anonymous donor. This work is licensed under a Creative Commons Attribution-NonCommercial-ShareAlike 3.0 Unported License (http://creativecommons.org/licenses/by-nc-sa/3.0/). © 2006-2010 Tony Asdourian, Arnaldo Cohen, Mimi Cukier, Angela Doyle, Rina Foygel, Tim Howell, Bill Tabrisky, Anand Thakker, members of the mathematics faculty of the Park School of Baltimore, Inc. 2006- 2010. When I visited, teachers were literally writing this curriculum as they were teaching; I think they were only a few units ahead of the students. It seemed like an amazing collaboration—everyone in the department was enthusiastic and on-board with the biggest project any department could take on—rewriting the entire 9-12 curriculum from scratch. Can you imagine your department doing this? Can you imagine everyone in the department devoting summers and free time to this task? It gets even better—now the department is now co-authoring articles for the Mathematics Teacher. So that’s what I want a copy of—how you create a collaboration between half a dozen or more teachers—how you get them to open up everything they do to the scrutiny of the department, to be willing to throw everything out, and then to fully invest themselves in writing and testing a new curriculum. Something tells me you can’t put that in a pdf. But if you are a math teacher, you can join the team—they’re looking for a math teacher. Thanks, John. Very nice tip. The materials look interesting indeed. Looking at the logarithm lesson quickly, I liked what I saw and would love to see how students in Detroit would do with it. This demonstrates the power of a team. The team’s power to transform is much greater than the individual. I think the team can whether the challenges it confronts from powerful lobbyists like parents, College Board, etc. There are some powerful lessons in this example. The Park School Math Department is experiencing real innovation. Bob, John – how do you react to this article? Jonathan Martin has a pretty good response to the article here: Innovation, Together and Alone. I don’t for a second think Park’s Math curriculm was created by a committee sitting around a table to 100% of the development time. In fact, I know singificant parts of it were written by individuals, who then came together with the department, and refined their ideas through collaboration. Individual reflection, alone time, whatever you want to call it, is a critical part of learning, creativity, and innovation. A large goal I have as a teacher is to help students find the balance between individual work and collaboration, which is more powerful than either method alone. Yeah, I read that but when I reflect upon my own experience I find all of the serious work that I do is done almost exclusively alone, and in silence. Now, I do occasionally send out emails asking for help and/or stop someone in the hallway for input, but these are very quick, isolated exchanges that act as ‘breaks’ from my own thought process. As soon as I get into ‘committee’ mode, stagnation occurs. Fairly obviously, collaboration dilutes my own influence as well, and I find that makes me disengage and start to divorce ownership; but that may be a ‘me’ problem. *one mind working in quiet and in solitude creates interesting and innovative ideas. *one mind’s work in solitude can be perfected when the ideas are introduced into a group setting and others reflect and collaborate. I would agree with your view on this Adrian. Collaboration and teachers working in teams is not the only way to achieve innovation and creativity within a faculty. I think we have to promote innovative ideas in all types of working environments. However, I also think that collaboration and teamwork is one powerful way to get teachers to develop curriculum, innovate their instructional strategies, etc. So for me it is both and not either or. Am absolutely in awe of what they’re doing. It’s a pity that this level of educational innovation is completely impossible in a public school – can you imagine? Faculty getting together and deciding on a philosophically consistent, thoughtful mathematics curriculum? Being willing (and able) to try things out, revise them, and go from there? Why, it’d almost be…. Thoughts? Outside of REAL scientific research, soft disciplines can produce ‘research’ to prove ANYTHING! That’s why I am much more reliant upon 22 years of teaching experience rather than anything that educational ‘research’, suggests. Thoughts? I understand the lens through which “we scientists” look at the work of the soft disciplines. We tend to be skeptical of the validity of the research or the usefulness of it. However, I have a different opinion particularly looking and reading a fair amount of literature and research from the soft disciplines (education). John Hattie’s work, Visible Learning: A Synthesis of 800 Meta-analyses Relating to Achievement, is an excellent piece of work that is good research. In this work, one conclusion to come out of the research is, “when formative assessment is used in the classroom student achievement goes up.” So yes, I understand how scientific research leads to conclusions that are hard to refute, but some research in the soft disciplines leads to important understands. Well said. I’m actually reading Hattie’s book too and was also surprised regarding what are and are not truly effective techniques. Something to keep in mind, though, is that progress on most tests (including most of Hattie’s ) is measured by algorithmic (traditional) exams. Regarding conceptual understanding and soft skills, other research is needed. This is where conceptual exams are helpful. I am reluctant to comment on something that I know nothing about (Hattie), but I am reminded of an anecdote regarding a local professor of education, who explains to his students (prospective teachers) that being able to efficiently and comprehensively search the research literature regarding education is perhaps the most important skill they will gain. When asked why he says that, he replies that sometime in the future they may be asked to justify some outlandish, progressive or non-traditional teaching method that they want to employ, and that with ‘searching skills’ they will ALWAYS be able to find a peer-reviewed study that backs up their position, no matter what that position is! It’s a fail-safe! Try finding a peer-reviewed research paper that says electrons carry a positive charge or that potassium does not react with cold water – that’s the difference between hard and soft science. This type of collaboration is exactly what I thought that I would be doing when I became a teacher. Although, I have my degree in social sciences, this cooperation and willingness to share information is very inspiring. I wish that all schools were able to develop their curriculums in this fashion because everyone in a department would be working towards the same goals.